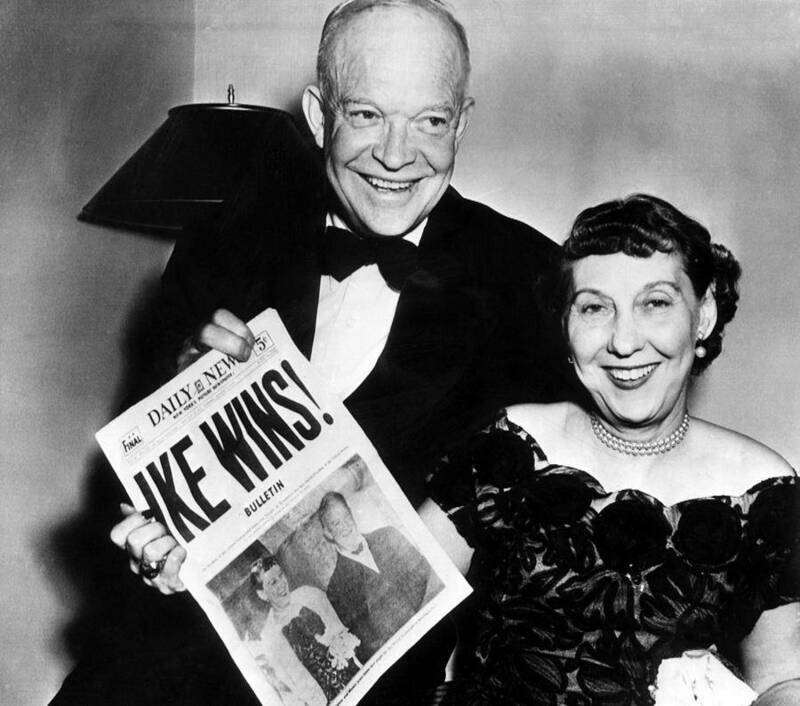 Dwight “Ike” Eisenhower with his wife, Mamie. Dwight D. Eisenhower was the World War II Supreme Commander of the Allied Forces in Europe who commanded the Allied Forces in the invasion against the Nazis. It was his superb leadership, planning and commanding ability that contributed to Allied success in World War II. He was also the 34th President of the United States, serving two terms of office from 1953 to 1961. Now you know who was the supreme commander of the allied forces. Dwight D Eisenhower was born in Texas on October 14th, 1890. He was the third of seven sons in the family. At the age of 20, he applied to the Naval Academy but was rejected for being over the acceptable age of entry. Instead, he went to the military academy at West Point and graduated in 1915. During World War I, he served as the number three leader of the new tank corps. He was promoted to Major after the war and was posted to Maryland where he remained until 1922. When America started to take action against the Axis Forces during World War II, Eisenhower was assigned to design war plans against Japan and Germany. He was promoted to senior command very quickly because of his outstanding administrative and organizational ability. On December 20th, 1944, Eisenhower was promoted to General of the Army. He exhibited outstanding leadership abilities during this appointment, winning the respect of the men serving under him as well as the admiration of his ally, Winston Churchill. After the war, he took on the office of President of the United States from 1953 to 1961. During his two terms, his many notable achievements include championing the development of the Interstate Highway System, the Eisenhower Doctrine, and ending the Korean War. In September of 1955, Eisenhower experienced his first health scare, suffering a heart attack that required several weeks of hospitalization. Eisenhower died of congestive heart failure on March 28th, 1969 in Washington D.C. He is considered by many contemporary Western scholars to be one of the greatest U.S. Presidents. Supreme Headquarters Allied Expeditionary Force (SHAEF) was the headquarters of the Commander of Allied Forces in north-west Europe, from late 1943 until the conclusion of World War II. U.S. General Dwight D. Eisenhower was in command of SHAEF throughout its existence. As a military leader, Eisenhower never underestimated the importance of planning and preparation. His experience taught him that war is chaotic and unpredictable and that the way to victory was to be prepared for as many eventualities as possible. If you want to succeed in what you do, planning is crucial. Plan schedules, deadlines, and contingencies so that you will always be focused and purposeful in your execution. Your team will be more willing to trust and respect you if you have a well-thought-out plan. Eisenhower won the respect of his subordinates and allies because of the diplomatic nature of his leadership. He led by belief instead of using his position to force people to do things out of fear. Using persuasion can be a very useful style of leadership. People follow and help you because they want to, not because they have to. Ask yourself what the other person can get by helping you achieve your goal, and help them realize this conclusion. Your team will achieve common goals thanks to their passion and sense of responsibility, and you will reap far better results. Eisenhower famously said, “Anger cannot win. It cannot even think clearly.” It was his mother that changed the way he looked at anger. After an outburst he had as a ten-year-old child, his mother told him that hating or being angry at someone only hurt one’s self; that often the other person didn’t care or even know about the anger. After reflecting on this, Eisenhower resolved to rid himself of this useless vice, and save his energy for thinking clearly. Well said by the Supreme Commander of the Allied Forces and has also been referred to as one of the famous conquerors in world history. Who was the supreme commander of the allied forces in World War I. On April 3, 1918, General Ferdinand Foch, formally was conferred the post of commander in chief of the western front in Europe by the Allied Supreme War Counsil. See Next Leadership Spotlight: Walt Disney: Masterful Innovator Through Imagination.